October is National Bullying Prevention Month! Every October, schools and organizations across the country join in observing National Bullying Prevention Month. The goal: encourage communities to work together to stop bullying and cyberbullying by increasing awareness of the prevalence and impact of bullying on all children of all ages. Chloë Grace Moretz, Josh Gad, James Marsden, Megan Hilty and Robin Roberts, Join STOMP Out Bullying™ in Honor of Blue Shirt Day ™ World Day of Bullying Prevention on October 6, 2014. Double click to watch Chloe’s video! Chloë Grace Moretz, Josh Gad, James Marsden, Megan Hilty and Robin Roberts are taking part in STOMP Out Bullying’s annual celebrity video series in support of Blue Shirt Day ® World Day of Bullying Prevention. In a moving tribute to kids and teens who have been bullied, these celebrities joined in to make sure STOMP’s message of bullying and cyberbullying prevention is heard around the world. Blue Shirt Day® World Day of Bullying Prevention is observed on the first Monday of every October. This year’s global effort takes place on Monday, October 6, when kids, teens and parents are asked to wear a blue shirt in solidarity, and take a stand against the worldwide bullying and cyberbullying epidemic. 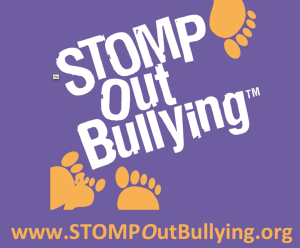 About STOMP Out Bullying: STOMP Out Bullying™ is the national leading bullying and cyberbullying prevention organization for kids and teens in the U.S. As you know, bullying, cyberbullying and bullycide have reached epidemic proportions. As the leader in this field they work aggressively to help young people. Created in 2005, the organization focuses on reducing and preventing bullying, cyberbullying, sexting and other digital abuse, educating against homophobia, racism and hatred, decreasing school absenteeism, and deterring violence in schools, online and in communities across the country. It teaches effective solutions on how to respond to all forms of bullying; as well as educating kids and teens in school and online, providing help for those in need and at risk of suicide, raising awareness, peer mentoring programs in schools, public service announcements and social media campaigns. The organization has helped hundreds of thousands of students resolve bullying situations and on their Help Chat Line alone – this year we have helped over 11,000 students and saved the lives of 178. These numbers increase daily. You can buy a blue shirt in honor of Blue Shirt Day® World Day of Bullying Prevention or wear your own – Let’s all wear BLUE!